Continuing from last week, the aim is now to classify the stone flakes based on their various properties. Three methods are used. LDA is an obvious standard. A classification tree is both simple and visually appealing. Random forest as a complex method, where more complex relations can easily be captured. Surprising with these data is that the classification tree is doing better than random forest with respect to predicting the input data. This is the same as last week. However, I now opted to make the group labels a bit more short. LDA is part of the MASS package. The settings are default. The plot function has been adapted, to retain proper labeling and colors. There are eight objects incorrect classified. Out of 71 complete cases, that is 10% wrong. 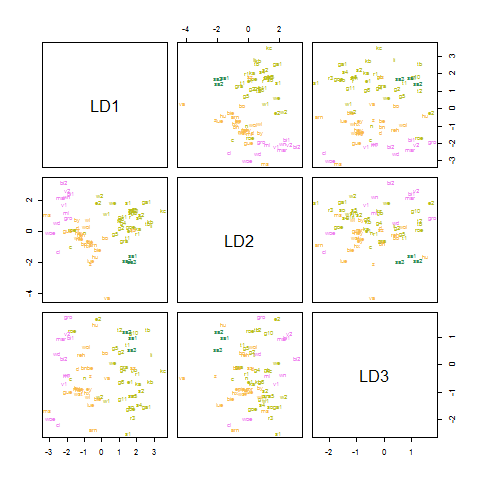 This is a small adaptation from the plot.lda function in MASS. At visual examination, it seems that the groups are not completely separated. Especially, I wonder if they are much better separated than last weeks biplot. Rpart is my favorite classification tree implementation. The only tuning is setting minsplit to 10, the default of 20 seems a bit large for 79 objects and four categories. The printed output is skipped, since we have the plot. The interpretation is pretty simple. First split on ZDF1, to distinguish old from young (less old?). The young can be split on LBI to Middle paleolithic and homo sapiens. The old by PSF to Levoillas and Lower Paleolithic. A final split between middle and lower paleolithic shows that the differences are not clear cut. There are ten incorrect predicted objects. Note that it is difficult to compare this with LDA, since objects with missing data (e.g. 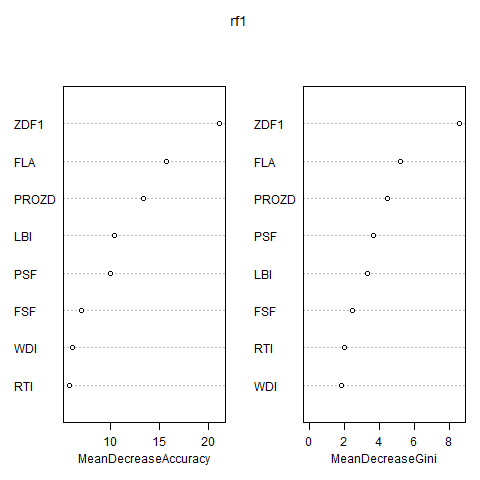 sk misses FLA, PSF, FSF) are predicted with rpart, while they were removed prior to LDA analysis. Note that cross validation makes for a much worse model assessment; about one third are incorrectly predicted with leave one out. Randomforest seems to predict slightly worse than the more simple methods, with OOB error around 21%. As might be expected, Homo Sapiens, with only 3 rows, is particularly difficult to classify. 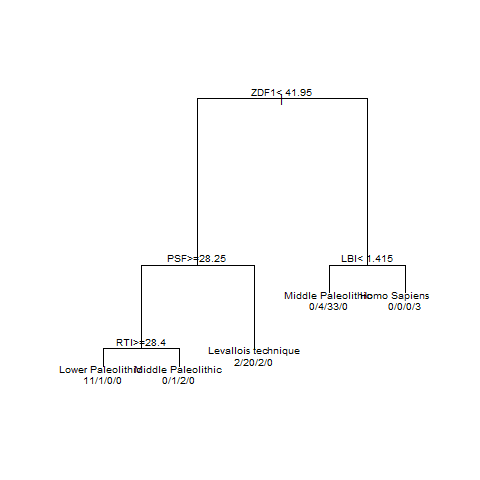 Similar to the classification tree ZDF1 is an important variable, but FLA and PROZD were not important in the classification tree but are in random forest.